YAMHILL COUNTY, Ore. - (April 10, 2015) - If you are handy with tools and want to help strengthen personal empowerment and wellness in Yamhill County, now is the time to raise your wrench. The bike recycling partnership that has already recycled more than 2,000 bikes has re-tooled and is now recruiting volunteers to repair bikes. The Pedal Power Partnership started in Yamhill County in 2012 through the efforts of the late Dean Williams and Waste Management. In 2014, the Association of Oregon Recyclers honored Williams as gOregonfs top recyclerh for his work with Pedal Power. Since Williams's death in November, partners have re-tooled the program to include significant roles for YCAP, the Newberg Retired Recyclers, Love INC of Newberg and Tommy's Bike Shop in McMinnville. "Many of our clients struggle with transportation issues,h said Steven Stone, YCAP client services case manager. gFor someone looking for work or needing an economical way to get to work or the store, a bike can provide important independence." Stone is now recruiting volunteers to repair bikes at YCAP, 1317 NE Dustin Court. A minimum commitment of five volunteer hours a month is requested. There is no cost to volunteer, thanks to donations from Waste Management, Tommyfs Bike Shop and groups including the Newberg Noon Rotary. Volunteers are welcome to bring tools, although most tools are provided. Waste Management receives bikes and bike parts at Riverbend Recycling Center three miles west of McMinnville and at the Waste Management Transfer Station in Newberg. Waste Management also covers basic program costs. Amity man wins "Recycler of the Year"
Yamhill County, Ore. - (June 25, 2014) – It’s official: Dean Williams, the retired veteran who crisscrosses Yamhill County each week with a pickup load of refurbished bicycles, is among Oregon’s top recyclers. 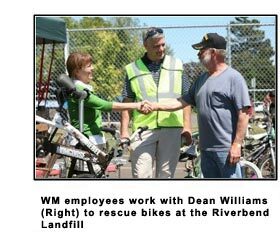 The Association of Oregon Recyclers has honored Williams for recycling 1,850 bikes in partnership with Waste Management-Riverbend. Williams is the driving force behind Waste Management’s successful Pedal Power Partnership, which refurbishes used bikes for children and adults in need. Williams’ award comes from the nonprofit trade association that advances waste prevention and recycling in Oregon. The association annually bestows the Alice Soderwall Reuse and Waste Prevention Award in recognition of the founder of the Glass Station in Eugene, where Soderwall championed the reuse of glass in innovative and resourceful ways. Initially, Williams collected old bike parts and bikes from Riverbend Recycling Center, refurbishing them himself and then placing the bikes with individuals through the Yamhill Community Action Partnership (YCAP). Three years later, Williams is collecting used bikes from Waste Management facilities in Newberg, Hillsboro and Forest Grove as well as Riverbend. He has also fashioned a network of volunteers to help repair the bikes, and his distribution partners include more than a dozen non-profit groups across Yamhill County. "Dean is amazingly resourceful," said Jackie Lang of Waste Management. "His leadership and passion have allowed us to reduce landfill waste and bring joy to many people across Yamhill County. Dean’s work has helped us see that bikes can be a source or empowerment and independence for people," she said. "It has been rewarding to hear how the bikes have make it possible for people to look for work and get to work, to exercise and to enjoy family time outdoors." A program in McMinnville that rescues and restores used bikes from scrap piles will be delivering 20 bicycles to children in shelters this Christmas. The Pedal Power Partnership, which includes the local landfill, a veteran who fixes bikes and a community service organization, has delivered 263 refurbished bikes to people need since it started in March. It started when Amity resident Dean Williams was looking for a replacement for his granddaughter's stolen bicycle. When he checked the recycling center at Riverbend Landfill, he found out that the bikes they get in are shredded for scrap metal. "I told them something had to be done differently because that was unacceptable," Williams said. "There are too many people in need, and those are perfectly good bicycles." Williams helped launch a program with Riverbend Landfill owner Waste Management to repair the bikes from the recycling center. The company pays for replacement parts, and Williams voluntarily does the work with help from students at Amity High School. Then he hands the bikes over to Yamhill Community Action Partnership, which serves low-income, senior and disabled people in Yamhill County. "He rebuilds them and gives them to us, and we distribute them through our local channels for people in need," said Lee Means, CEO of YCAP. It's not just kids using the free bikes, Means said. It's also adults who have been in jail, who have had their driver's licenses suspended for drunk driving, who are escaping domestic violence and don't have any belongings, or who have developmental disabilities. "We originally thought the children's bikes were what would go the fastest," Means said, "And we were so surprised to find the number of adults that need bikes." YCAP runs three transitional shelters for homeless families, where people can stay for up to 6 months. During the holidays, the organization works to provide Christmas presents for the families in the shelters. "There are a lot of children involved," said Means. "At one point we had 22 kids in the transitional shelters at Christmas time. It's very tight. There's very little space for kids to play. It's not the kind of place you would want to be with your family for Christmas, but we have a long waiting list." Jackie Lang of Waste Management said the bikes that come into the recycling center in McMinnville would normally be disassembled so the metal could be shredded and recycled. "Metals recycling makes sense," she said. "But it doesn't make sense to disassemble a bike for metal if the bike still has some miles left on it."